Built in 1954 in Napoli (Italy) and first named CS Salernum and operated as a telecom cable ship under that first name from 1954 till 1984. Later the vessel was sold to Transoceanic Cableship CO and renamed CS Charles L. Brown, operating as a cable repair ship until 2002. The island St. Eustatius bought the vessel in 2002 for the amount of 1 US $ to give her a second life as a living reef. Many parties on the island volunteered to clean and prepare the vessel before sinking. The 25th of July at 17h42 the Charles Brown got to her final destination on the Statia’s ocean floor. The Charles Brown is one of the largest (100m/ 327ft) and most impressive wrecks in the Caribbean. The view when you approach is spectacular. 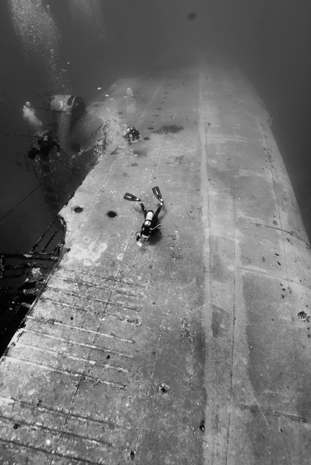 The wreck has most of its superstructure intact and is easy to penetrate for those who want to. Deep see fans and sponges now cover the deck and cable reels. Horse-eye jacks form dense schools above the wreck while huge barracudas (including the huge resident named Charly) live right on it. On the bottom you find huge amounts of Yellowhead jaw fish and reef sharks often patrol here. Angelfish and turtles are common and with a bit of luck you even see an eagle ray passing by. While the Charles Brown lies at a depth of 30 meters/100 ft it is also suitable for less experienced divers who can stay on the top of the wreck around 18 meter/60 feet. Thousands of divers have witnessed the transformation from a white steel vessel into a living reef in the past 10 years. Like a good bottle of wine, it’s getting better and better every year.